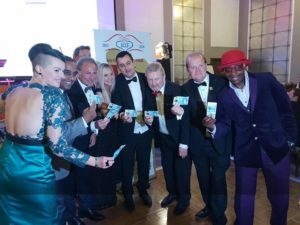 The charity’s new High Five campaign was launched at the anniversary Ball at the Bournemouth Hilton on September 22, it asks people to contribute five pounds or more, with the goal of raising £250,000 in the coming year to fund even more grants. We now hope people, groups of friends, businesses – everyone – will get behind the High Five campaign, organising their own events and also supporting ours so together we can help even more Dorset people with cancer in 2019 and beyond. Watch this space for lot’s more information as the campaign progresses! Consider pledging a regular amount to DCCF – perhaps a ‘fiver’ a month?